After two years (yes, two whole years now!) of posting three times a week, we decided to do something fun for our anniversary and give ourselves a little break. Instead of taking time to style outfits ourselves, we called upon Our Beautiful Husbands (or OBH as they named themselves and as we refer to them in this context) to step out from behind the camera, and put on stylists' hats as well. We gave them full creative control from not only choosing our outfits, but the shoes, accessories, hairstyle, and lip color. (This resulted in many questions and discussion like what different lip colors even mean and the pros and cons of flat sandals vs. wedge sandals, but those are stories for another day.) We did our best to stay out of their way, providing them only with the parameters that this look was for a date night (when asked for context, we thought it was only fair to provide that) and not to use a look we've styled on the blog before. That's just cheating off our homework. 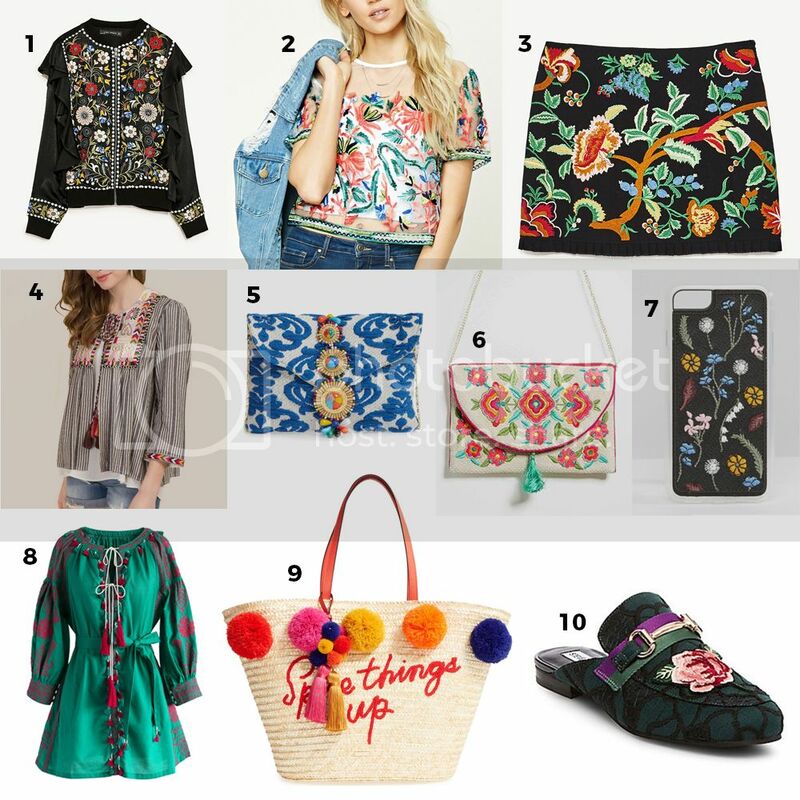 See the looks they styled for us below AND we have a special giveaway for you at the very bottom of the post! My husband, Andy, enjoys putting together outfits for himself, sometimes with my input, but I don't think he ever imagined he'd style a look for me! He rated himself "1 out of 100" of how pumped he was to style a look for me beforehand, but quickly warmed up to becoming a stylist once he started sorting through dresses. After having me try on a couple, he decided on this super retro floral sweater dress that's one of my favs. He moved on to shoes next and chose some black bow flats. Next: hair. After scrolling through our Instagram photos, he decided that since I usually had my hair down, I should switch it up and put it up in a bun. By the time my hair was up, he had an array of earrings picked out for me to try on. He settled on black starburst earrings and finished the accessories off with a black purse and black, round sunnies, both perfect for the retro vibe. He also chose a bright red lip color, which I realized I haven't worn much lately, and it's gotten me back into wearing bright red lips again. Who knew my husband would inspire my makeup routine! In the end, it was a lot of fun and I was really happy with the end product. Maybe I could even talk him into doing it again in two years! My husband, Graham, is a pretty snappy dresser himself. He knows the ins and outs of how to tie a bowtie and how to properly wear a suit. However, when I asked him if he would style an outfit for me that I would wear on the blog, the color drained from his face and he got very fidgety. How was he supposed to go through all of my clothes and pick an outfit?! Nevertheless, pick an outfit he did! 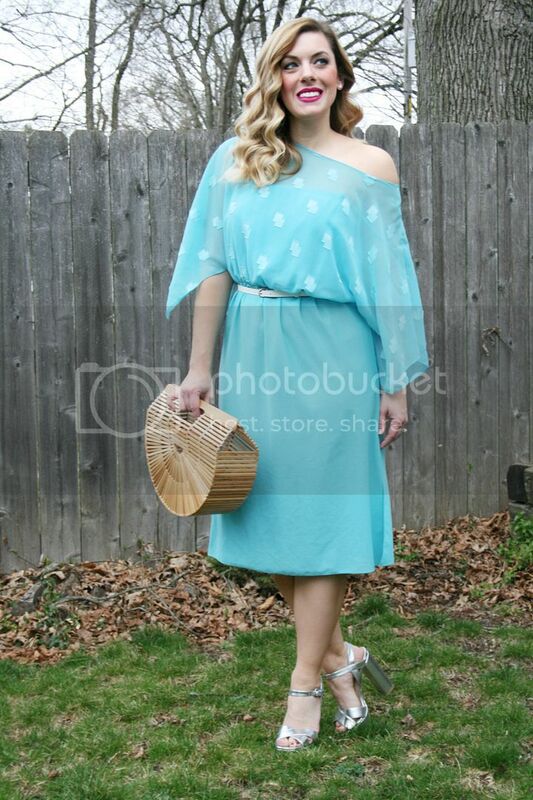 After much browsing and thinking, he decided to plan an outfit around a new straw bag I recently purchased from Etsy. He liked that it was summery and decided to find a dress that would go with it. He ended up picking a dress that I wore a ton last summer because I like it so much, so I was super happy with his choice! We're so thankful for OBHs that support us in this endeavor that is Mod Circus and we're so thankful for you, our readers! 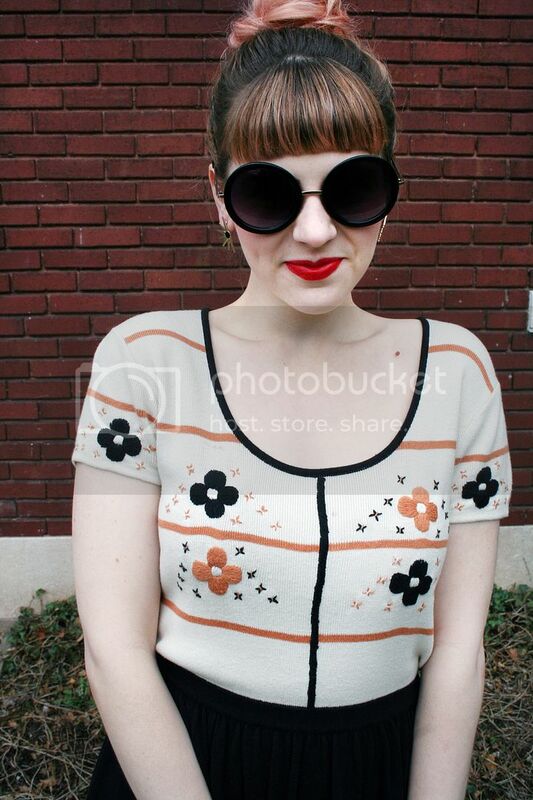 To show our appreciation, we're giving away a $25 Modcloth gift card to a lucky winner. Enter below for your chance to win! If you've been following us for a while or a even week, you know we don't take ourselves too seriously here at Mod Circus. 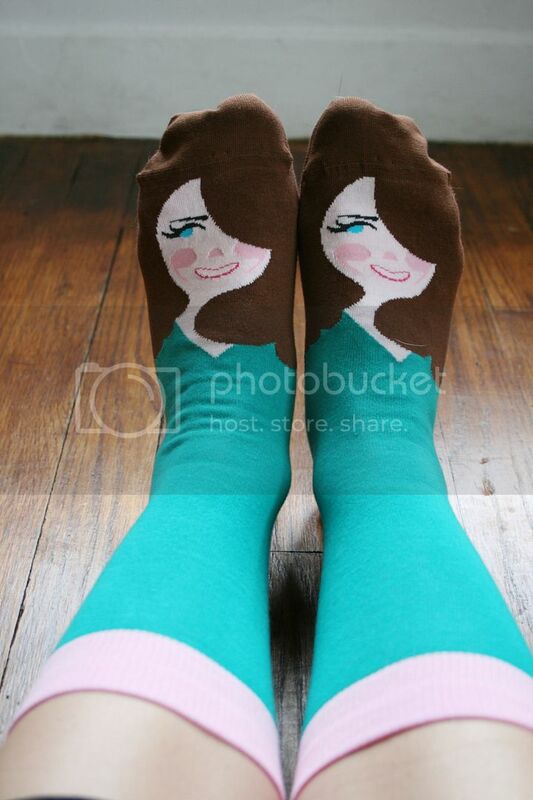 That's why when we discovered these socks from Chatty Feet, we were full-on LOL-ing looking at them. Not only are the designs super fun and retro-inspired (that's basically our life motto), but the names given to the characters are so entertaining: Kate Middle-toe, Albert Eisnstoe, Frida Callus, and Vincent Van Toe are some of our favorites. 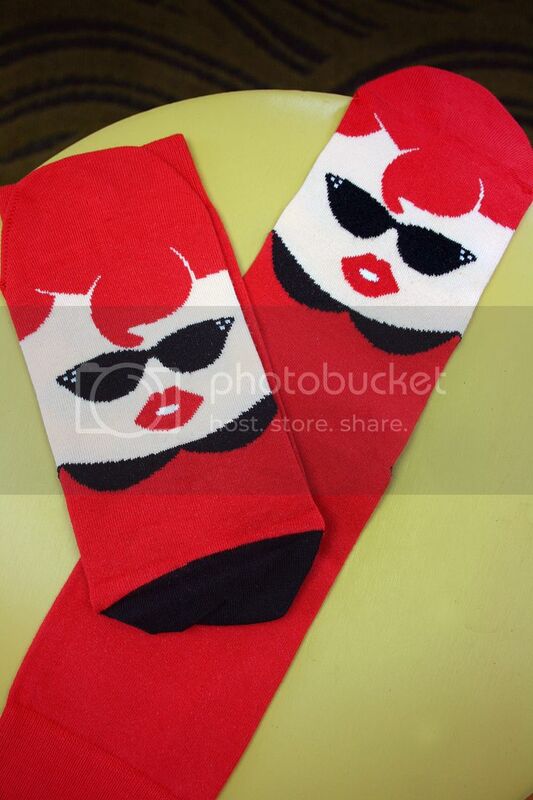 I have to be totally honest, I kind of had my heart set on Frida Callus when I looked at all the socks, but these socks go like hot pota-toes!, so when I found she was out of stock, I went with the super adorable retro Sandy sock instead. 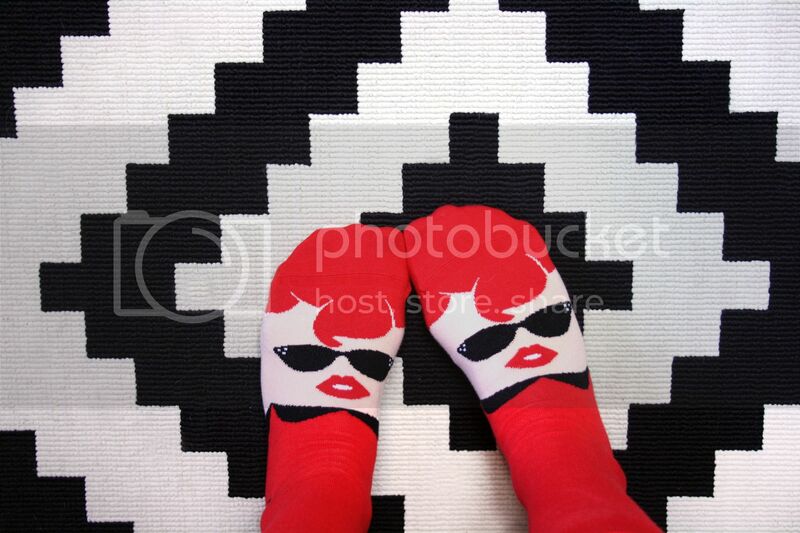 I love the cheery, bright colors and the fact that the faces are both on the top and bottom of your feet! 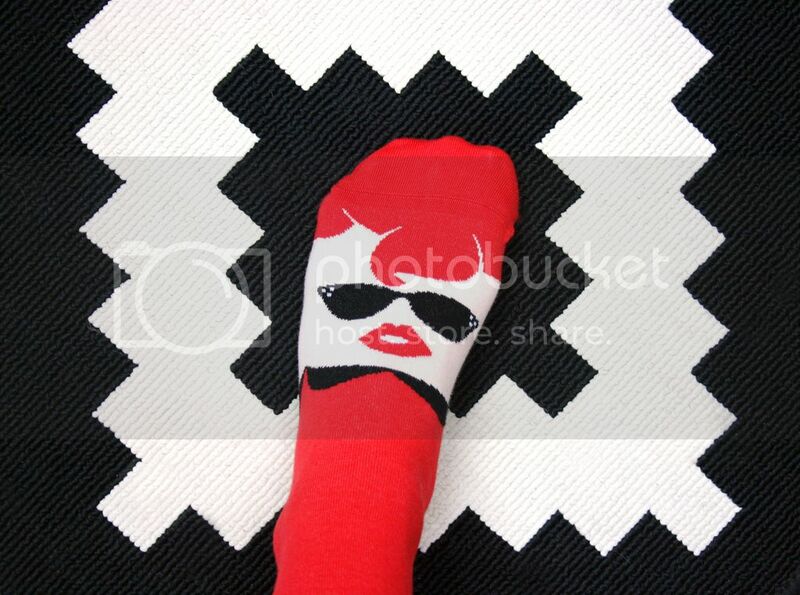 These socks are great quality and I love the fact that you can have this secret cool alter ego you're rocking under your boots. Any character wearing cateye sunglasses and a Peter Pan collar are toe-tally great in my book! I went for the Kate Middle-Toe version because, come on. 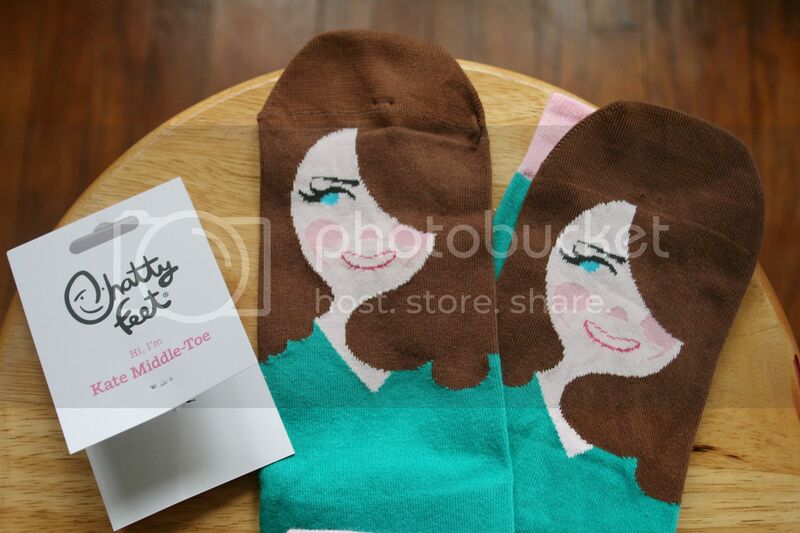 How could you not get a pair of socks with a name like Kate Middle-Toe?! Also, I'm slightly obsessed with all things royal family and British, so it was a no-brainer for me. I was pleasantly surprised at the quality of these socks. They are a super soft material with just the right amount of stretch. I love the bright colors as well. 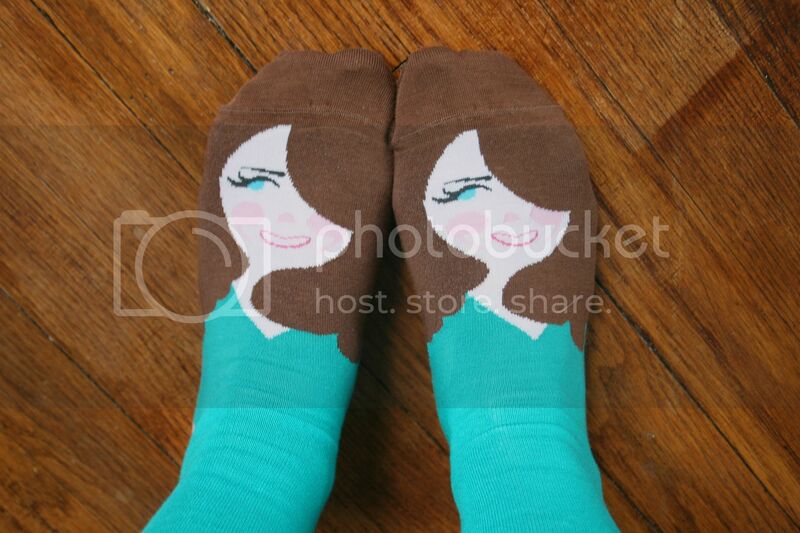 I'm confident these will be my go-to favorite socks from now on! 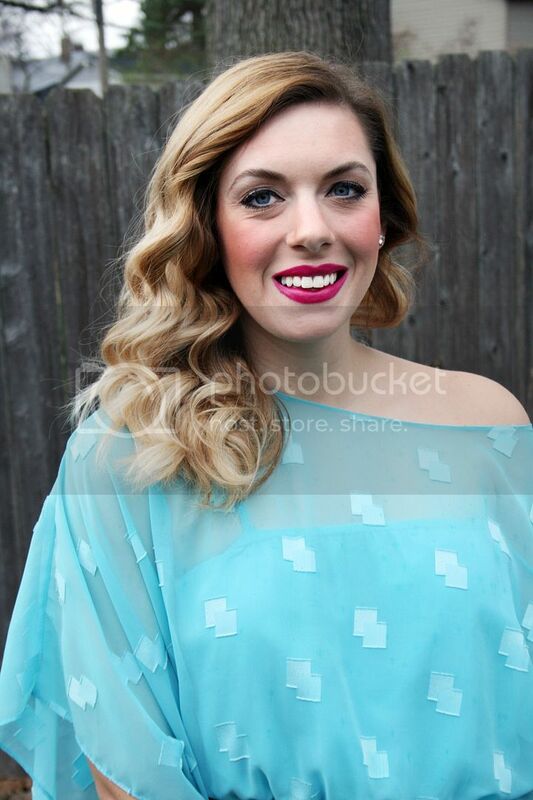 We were recently contacted by Nicole from CHC Vintage to try out a few of her company's awesome vintage dresses. We, of course, were happy to oblige! CHC stands for Crazy Hot Clothes and I have to say, they're right on the money with that one! They have tons of vintage clothing to choose from and they are now offering a brand new subscription box service. You pick a style category and pick how often you want to receive the box and boom! You're in business getting all sorts of cool vintage pieces. You can pick 1, 3, 6 or 12 months. 1. You tell them your dress size. They offer standard and plus sizing. 2. You choose your style: Bohemian, Minimalist, 90s Grunge, Romantic, or Vintage Prints. 3. Dresses are $35 a piece, and can be purchased month to month, which is a significant discount from our regular dress price. At 3 months you pay $30 per dress, at 6 months you get 1 free dress and at 12 months, you receive over $100 in savings. 4. One of a Kind, Genuine Vintage Dresses are selected for you by their stylists and dresses are available for one exchange (customer pays return shipping). 5. Free US Shipping on every dress that will be shipped at the same time and tracking emailed to you for every dress. I told Nicole that I wanted something from the Romantic category and I think this dress fits that style perfectly. The color is a gorgeous blue and the top's flowy sleeves make for a perfect romantic statement dress. I dressed it up with silver heels, a thin white belt, clutch and a bright fuchsia lip. This dress would be perfect to wear on a date night, to a fancy event or even dressed down with sandals. 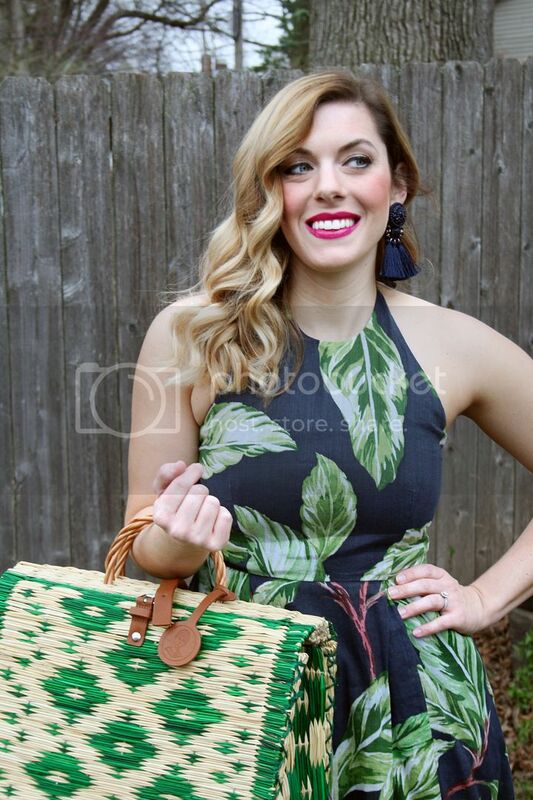 I'm excited to check out more of CHC's vintage pieces this spring and summer. Check them out in two places, their website: http://www.crazyhotclothes.com/ or through CrateJoy: https://www.cratejoy.com/subscription-box/chc-vintage/. What do you do when you find a totally dreamy pair of pants that are slightly more than you want to spend, and by the time they go on sale, you don't snag them in time? You make your own, of course! I loved the edgy yet whimsical look of a pair of lace-trimmed cropped flares from Zara (see inset above), and figured I could probably take a crack at crafting my own from a pair of too-long flares I already owned, and I couldn't be happier with how they turned out! As an added bonus, I only spent about $14 on this whole project! 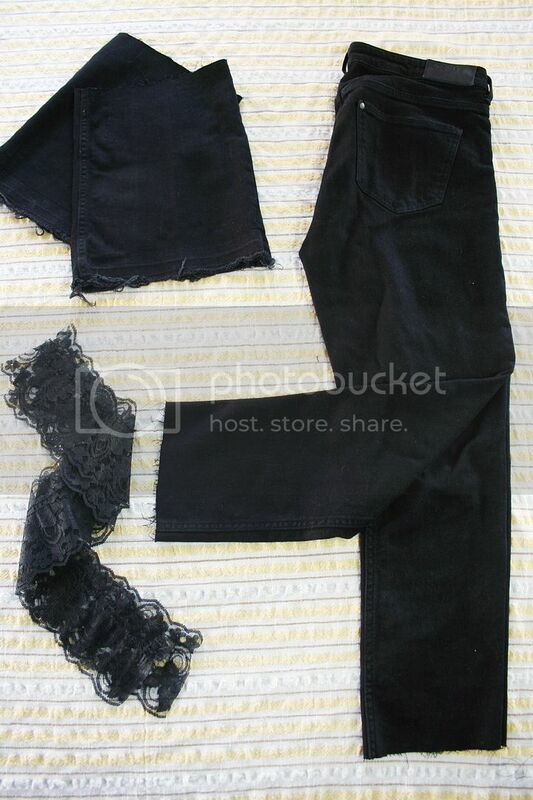 All you need besides your standard sewing supplies (sewing machine, pins, black thread), are a pair of black flare jeans (I swear H&M always has these on their sale racks in-store–I snagged some for $9.99, but they aren't online) and about a yard of wide lace trim. I got trim with elastic, since it was only $3.99 a yard compared to $10+/yd, and then used a seam-ripper to remove the elastic band. Now that you've got all your components, let's get started! 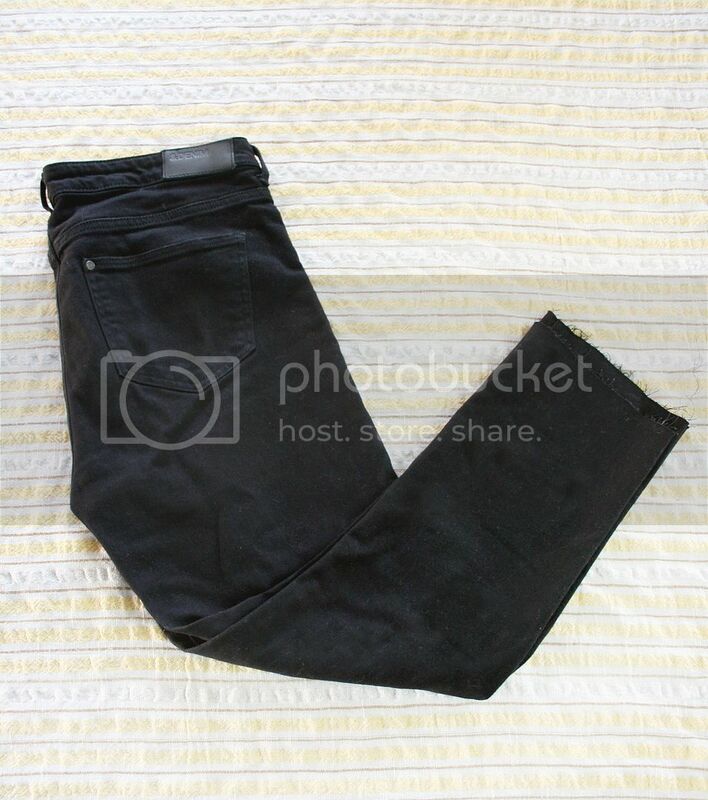 Next, turn your jeans inside out and put them back on. Pin the inner seams from the knees down to create a slim fit pant. The drama will be in the attached flare we add back on, so taking the flare out of the top half is needed to create contrast. Sew the inner seams of the pants and cut off excess material. Make sure they fit well right-side-out and set aside. Now, grab your lace! Measure the lace out, so the length of each piece is the circumference of the bottom of the flare. 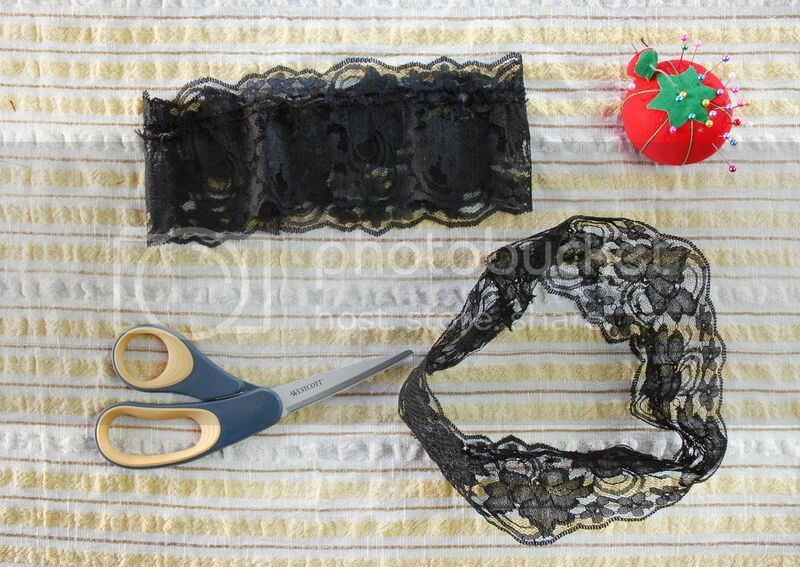 Pin into a circle and sew together, to create one band of lace for each. 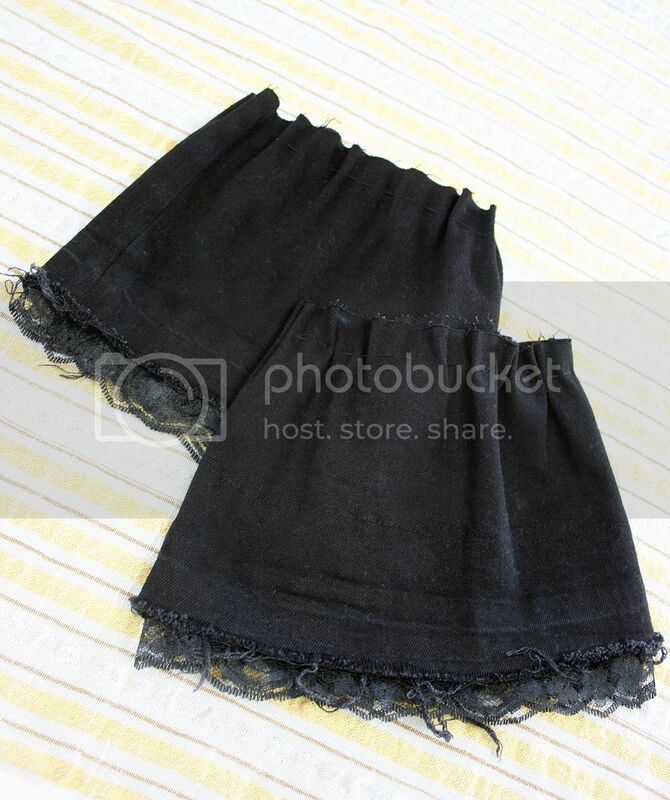 Next, turn your detached flares inside-out, pin the lace around the bottom hem, with about 1/2 inch exposed at the bottom. You can always go in and cut more off the hem later if you'd like. Pin the lace around the hem of the pant and sew into place around the upper edge of the lace using thread that perfectly matches the jeans. Then, trim the tops of the detached flares so they measure about 6 1/2 in. tall. You can mock these up on the pants first to see where you'd like them to fall and customize the height. 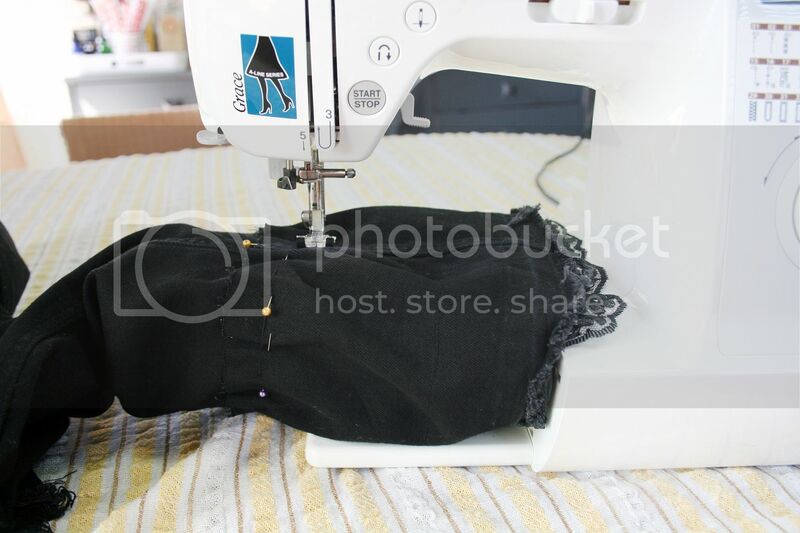 Using a large needle and sewing by hand, double up black thread and make a large stitch around the top perimeter, about 1 inch down from the top of the flare. Pull the thread tight, so the fabric bunches and the inner circumference is the same as the slim leg pant you'll be attaching it to. Knot the thread and cut. Repeat for second flare. Now, all you have to do is attach the flares to the pants. Pin the flares on where you want them to fall (probably a good idea to try them on again). 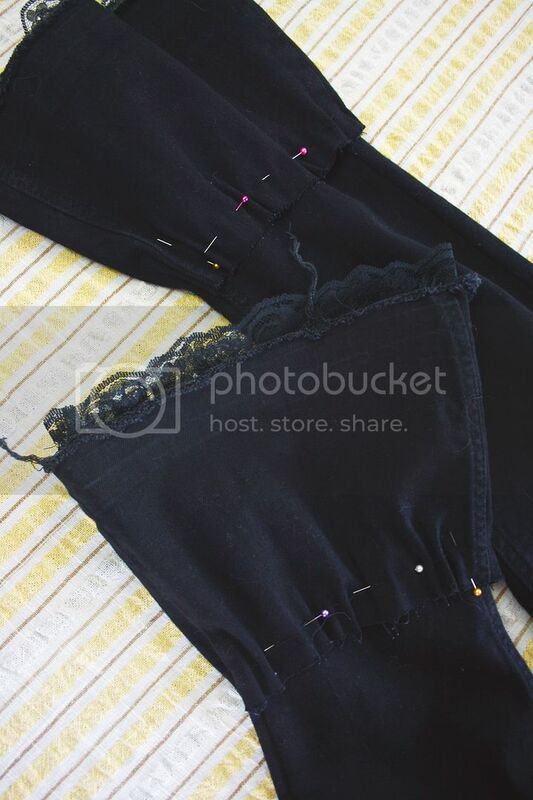 Use a sewing machine to stitch over the bunching stitch you just made to attach both of the flares to the pant legs. 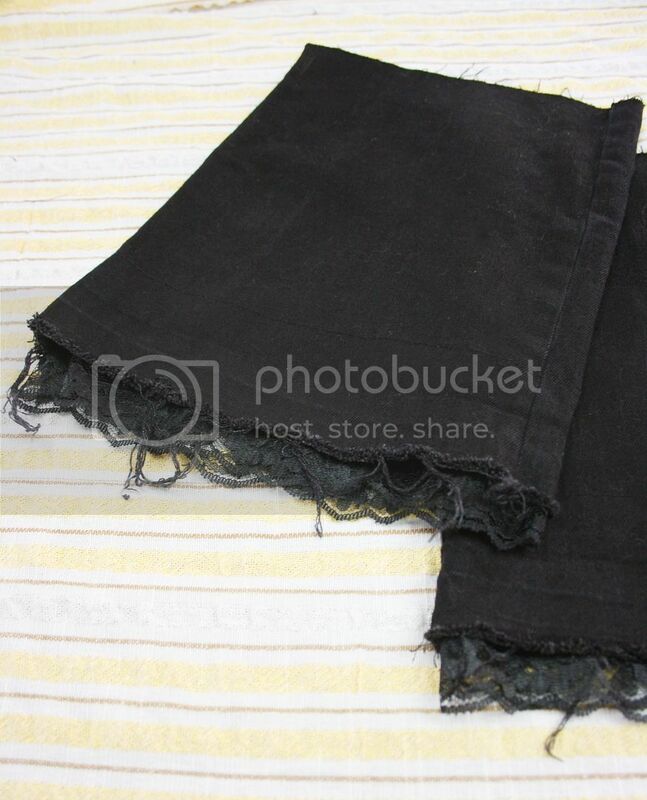 Last, you have the option of trimming the bottom of the jeans to create an uneven hemline, and expose different amounts of the lace around the perimeter. (I cut mine so the pant is slightly longer in the back than the front, or you could make more severe choppy cuts for an edgier look. You're done! 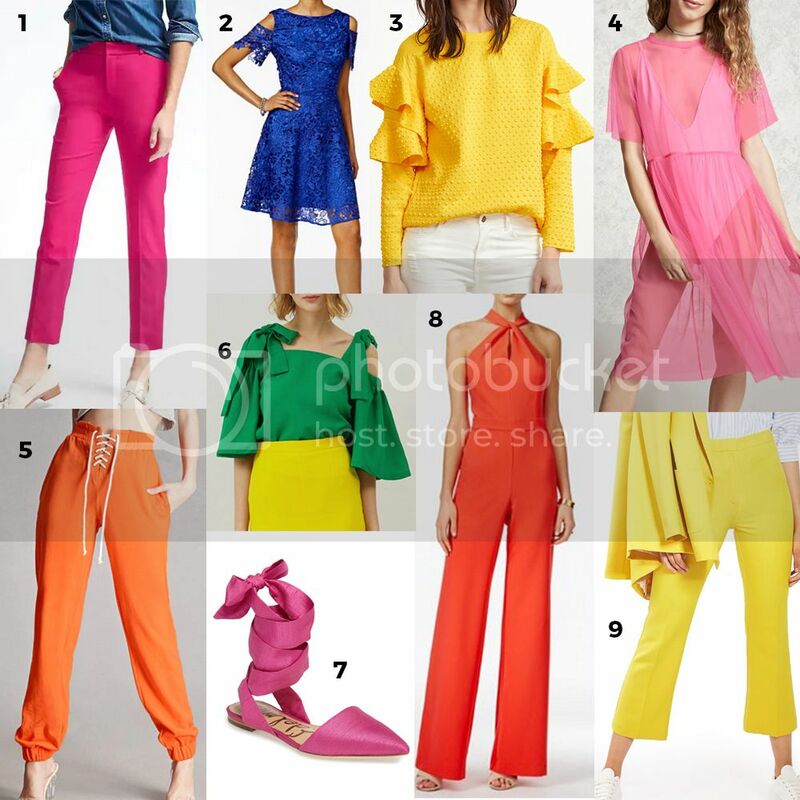 You've now got some ultra-stylish jeans that check off boxes for multiple Spring trends: flares, cropped pants, ruffles, and lace. No one will know that you've made these trendy trousers on the cheap and that they didn't cost and arm and a leg! This year has got us itching for Spring a little extra because we've had previews of warm spring-like weather much earlier than usual. We may or may not have already been stocking up on pieces recently that we're ready to bust out at a moment's notice. So, we've rounded up a few of the trends that we are extremely excited about this season. The best part is that there's tons of overlap between all of these trends, so you'll notice that some of our favorite finds had trouble fitting into just one category! 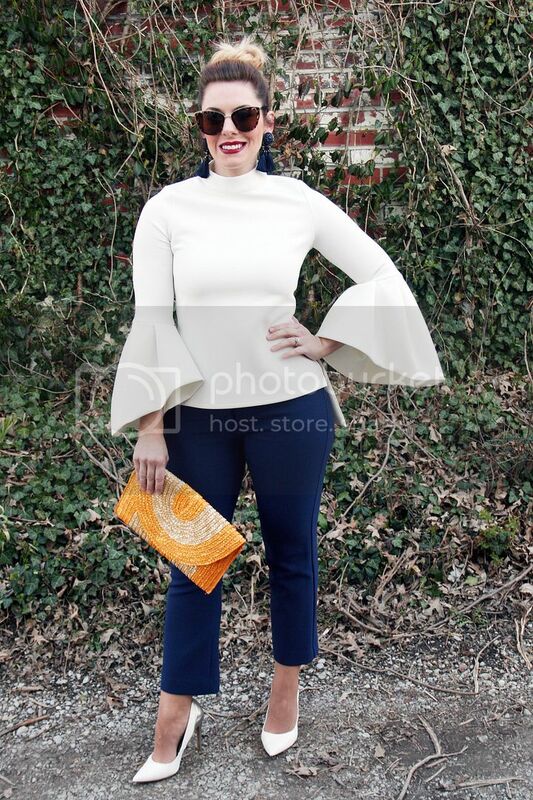 Giant ruffles, strong shoulders and humongous sleeves are all the rage this season. 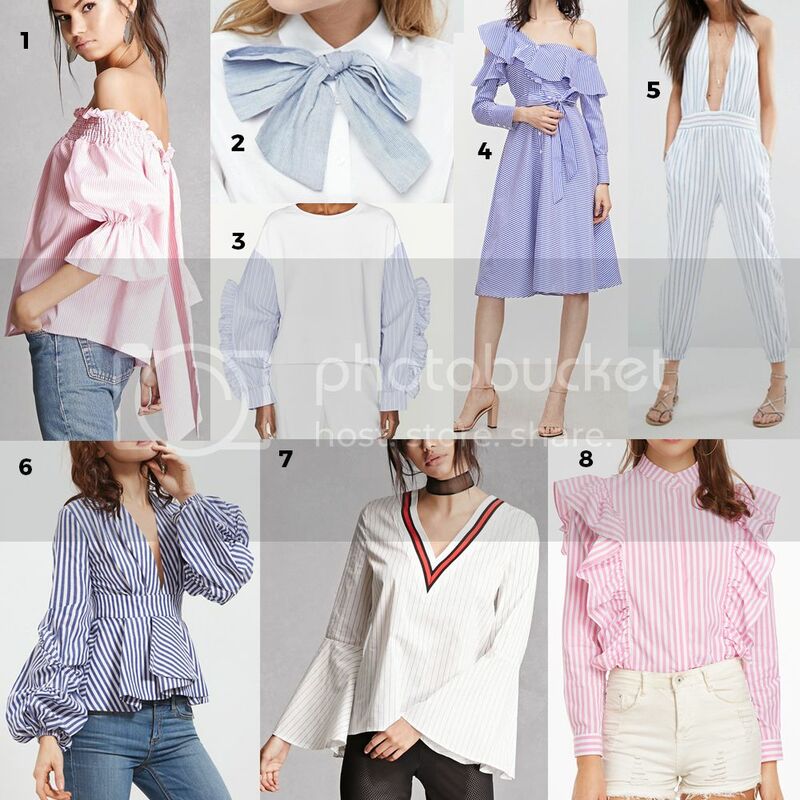 You will be hard pressed to find a top that doesn't offer some sort of embellishment or fancy structure right now and we can't wait to wear them all! This trend is literally everywhere at the moment. Pinstripes are always a classic look, but you will also see them being mixed in with the topheavy trend we mentioned above. Whether in blue or white or other colors, this is sure to be a huge hit all spring and summer long! Mules have been popping up slowly the last few months, but spring is the perfect time to really get into this trend! 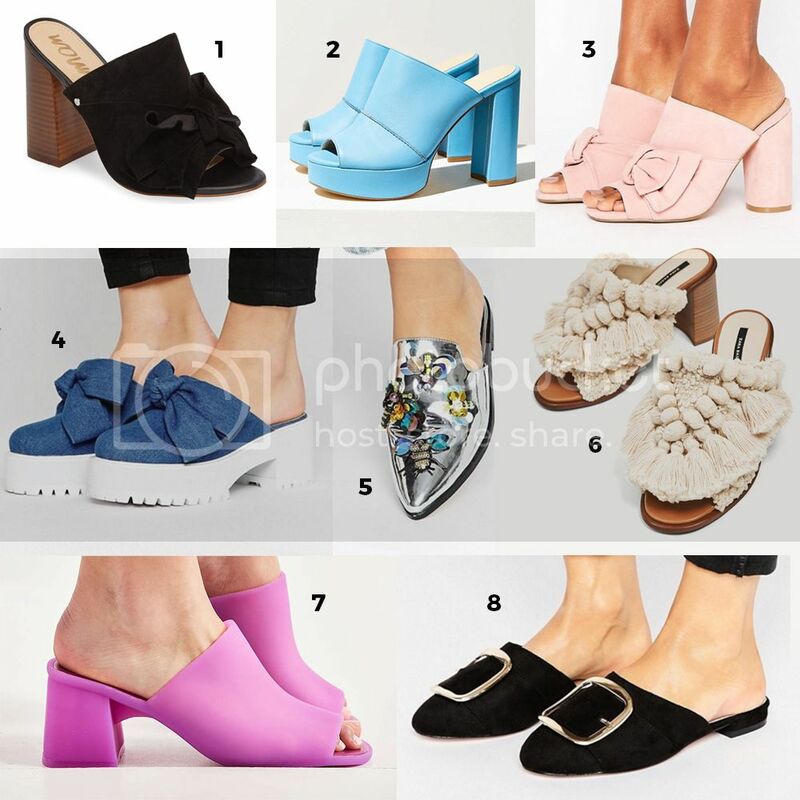 We're seeing mules in every way imaginable, with bows, open toes, high heels, flats, metallics...you name it, there is a mule to fit your taste. Embroidery is another classic that is making a resurgence this season. You'll find it on everything from dresses and tops, to shoes, bag and even phone cases! It can be styled to be whimsical, boho, quirky, or super elegant; it crosses all genres of style. 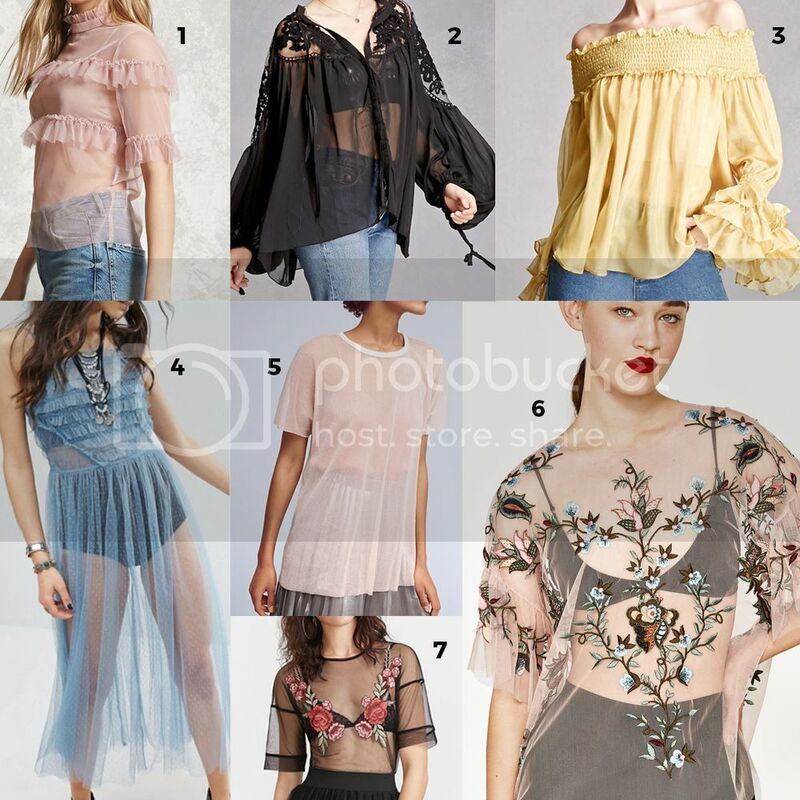 Sheer pieces are perfect for the warmer months, because you can layer them (another trend for spring) and not feel weighed down. Another thing you'll be sure to see is the combination of embroidery and sheer material. It seems like common sense that bright colors would be in for spring, but these pop art colors are taking it to a whole new level. You can mix and match your bright colors, or keep it minimal with accessories. Either way, things will be looking really bright! 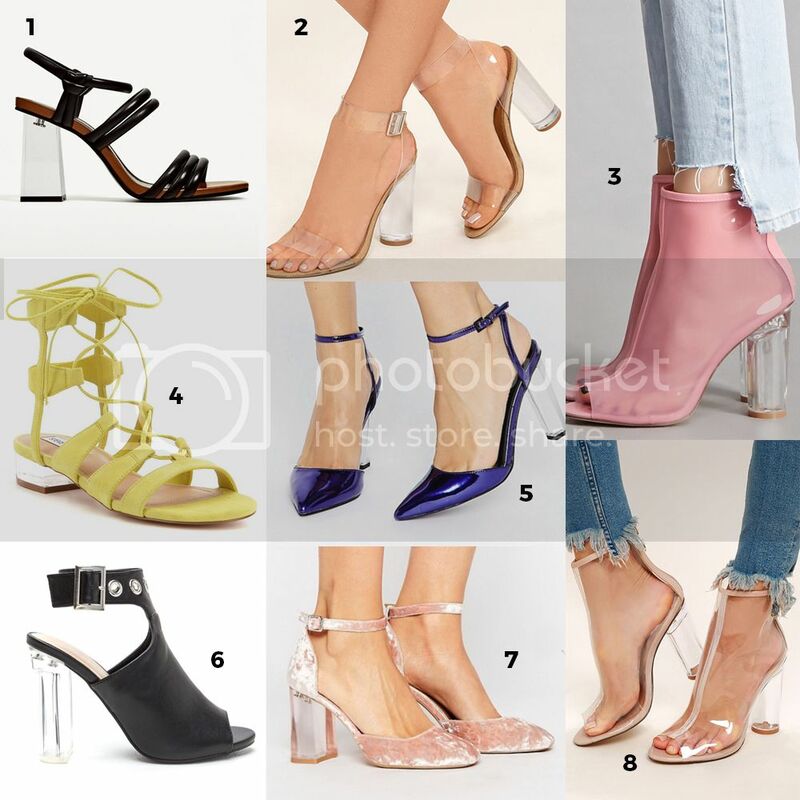 The lucite heel trend is something that is a little unexpected, but super fun! Transparent details are going to be on everything from purses, to backpacks, to rain jackets this season, but we especially love it on shoes! It will run the whole gamut: sandals, heels and boots, and even mixed with clear material to give the illusion that you aren't wearing any shoes at all! What are you most looking forward to this spring? Let us know in the comments!